This is the second in our >>Cruising in the Bahamas 2017 Season Recap<< series. In our first installment, we talked about the route we took, the anchorages we stayed at and shared some fascinating and not-so-fascinating tidbits, like our average cost per night and what TV shows we binge watched. 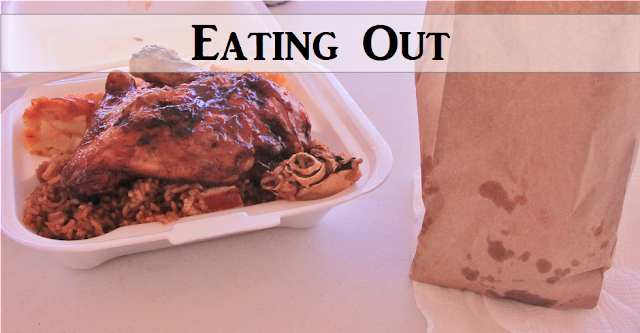 In this installment, we talk about something far more interesting - food! I'm one of those people who needs regular feedings, so when my next meal is going to happen and what it's going to be is always top of mind for me. 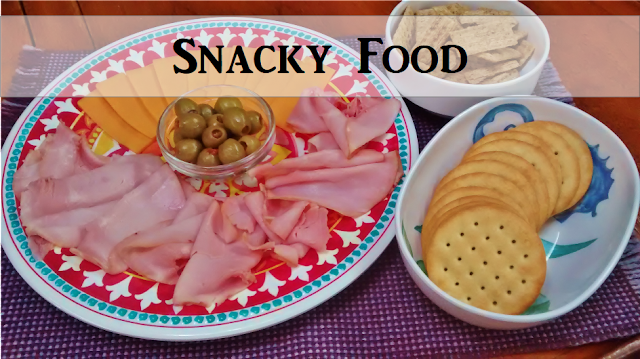 Grab yourself a snack, sit back and read on and we'll tell you all about the provisioning we did before we left for the Bahamas, grocery shopping in the Bahamas, what we cooked on board, and eating out in the Bahamas. 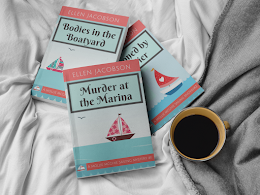 I was looking back at a blog post I did about provisioning aboard our boat in New Zealand and not that much has changed since then. 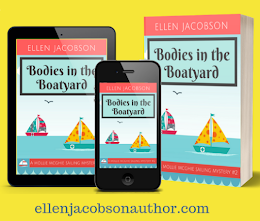 I make a list of what we need and stock up, I buy a few things we don't need and will never use (hello can of three bean salad), and squirrel stuff around in the various cubby holes in our boat. 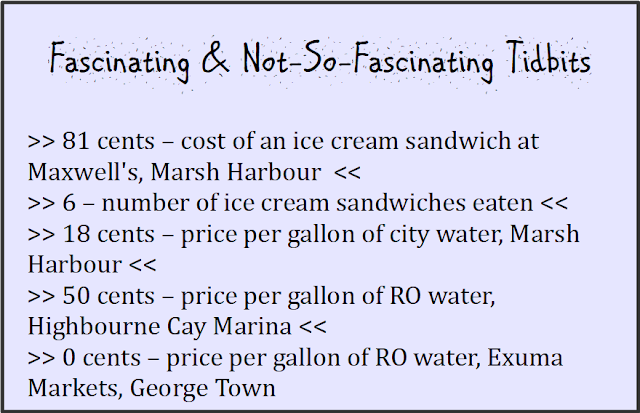 We've cruised in the Bahamas before, so we had a good idea of what to stock up on before we left and what we could buy there at relatively reasonable prices (like chicken, ground beef, hamburger buns, butter and government cheese, which is surprisingly tasty). 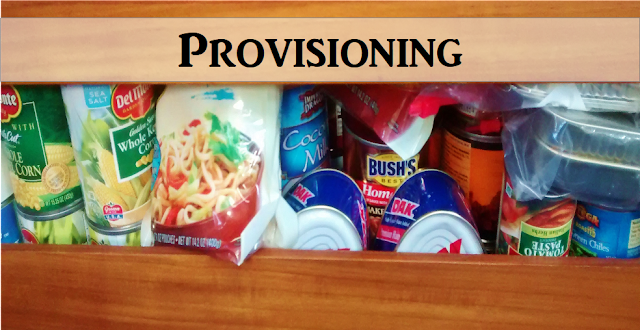 Everyone's provisioning list will be different, but here's an idea of the types of things we took. It's probably worth noting that we have a fridge, but we don't have a freezer. Tomatoes, corn, beans (black, kidney, baked, white, chickpea, refried), potatoes, chipolte peppers, green chilies, jalapenos, sun dried tomatoes, olives, roasted red peppers, sauerkraut, peaches and pineapple. Note: Scott is not a fan of sauerkraut. That doesn't stop me from trying to feed it to him periodically. Canned chicken, canned ham, smoked oysters, shelf stable chorizo, kielbasa (goes great with sauerkraut! ), brats, ham steak, deli meat, pork loin and Aldi's pulled pork. Note: Overly processed meat products, like brats, last a long time in the fridge. Sure, they're not great for you, but they're tasty in their own over-processed, sodium enriched way. Apples, cabbage, carrots, butternut squash, onions, garlic, potatoes, lemons and limes. Note: Wrap lemons and limes in tin foil and they last a really long time. Your gin & tonics will thank you. Beer, wine, gin, tonic water, cola, root beer, lemonade, tea bags and milk (UHT and powdered). Oh, and a ton of coffee. You can never have enough coffee. Note: Beer costs a fortune in the Bahamas, like $40 a case. Stock up before you leave. Your normal jars of spices, curry paste, stock cubes, hot sauce, sriacha sauce, soy sauce, vinegar, olive oil, canola oil, sesame oil, cooking spray, syrup, tahini, ranch dressing mix, onion soup mix, gravy packets and taco seasoning packets. Note: The ranch dressing mix is for the spicy pretzels that we like to have with sundowners. Also, a popular addition to cruiser get-togethers. Lentils, rice (basmati, brown minute rice, jasmine, long-grain, ready-to-cook Mexican and yellow rice packets), pasta (spaghetti, rotini, elbows and tortellini), barley, couscous, quinoa and dried beans (black, pinto & chickpea), udon noodles and oatmeal. Note: I prefer to used canned beans rather than dry. They're ready to use and you don't have to use up your precious water supply to soak them. 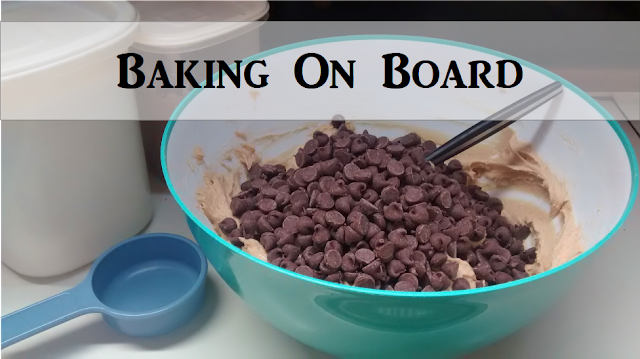 Flour, yeast, baking powder, baking soda, chocolate chips, brownie mix, pancake mix pecans, walnuts and raisins. Note: Yes, I use pre-made pancake mix. Don't judge. Granola bars, coconut milk, crackers, pretzels, Aldi's dark chocolate bars, instant mashed potatoes, peanut butter, jam, dehydrated vegies, pesto and tortillas. Note: Tortillas last forever and take up very little storage space. Love them. Are you confused by the picture above? Are you thinking - "Hey, that's not a grocery store!" That's true it isn't. 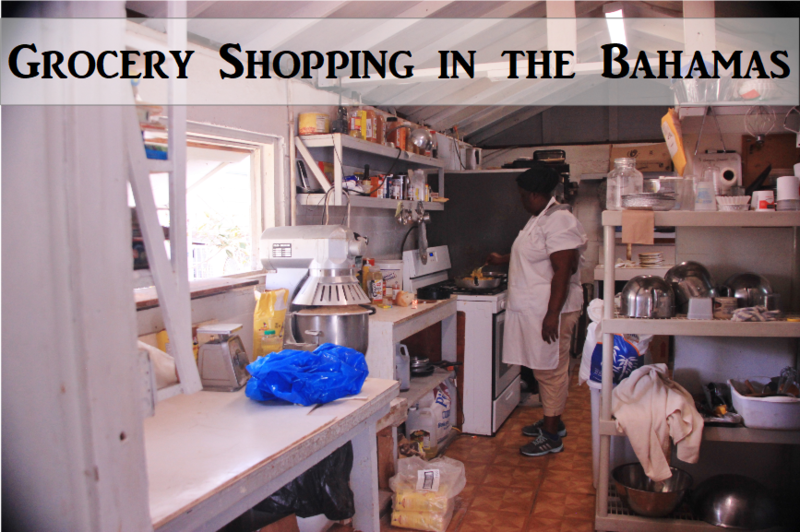 It's the kitchen next to Vernon's grocery store in Hope Town where they bake bread, pies and make other treats. But, it does give you an idea of what grocery shopping can be like in the Bahamas. You'll usually find small mom n' pop / corner type stores (like Vernon's), but you can also find large, modern type grocery stores like you might find in the States in larger settlements. While we brought a ton of food with us, we still needed to hit the grocery stores for things like fresh meat, milk, cheese, butter, fresh veggies (usually onions, cabbage and carrots), fresh fruit (usually apples) and the occasional ice cream sandwich bar. We also ended up buying cans of cola a few times. We seriously underestimated how much soda pop we would be drinking. But when it's really hot outside, a cold can of pop tastes amazing. 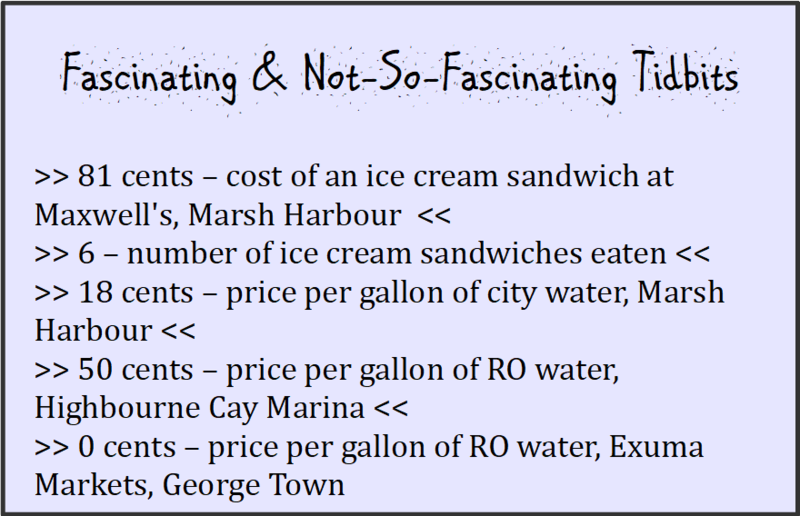 Soda pop can be really expensive in the Bahamas. We steered away from the name brand and got the cheaper, generic stuff. We do a lot of cooking from cans and jars on board. 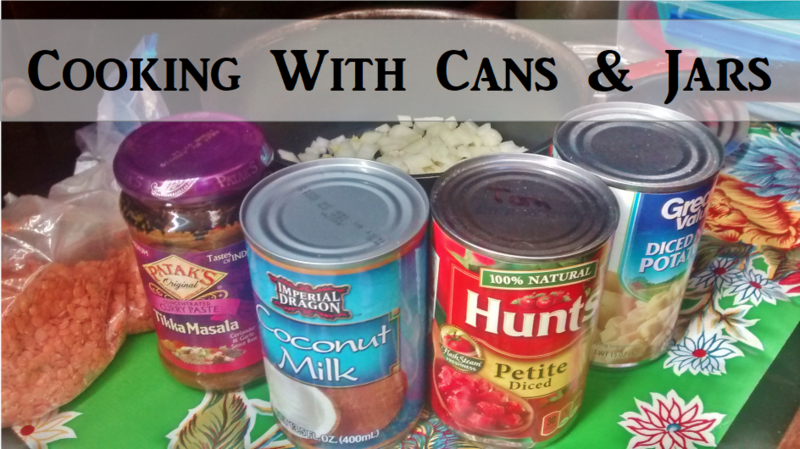 I remember when we were getting ready to move onto our first boat in New Zealand, I did a lot of experimenting with recipes made from canned goods. I was amazed what you could make without using a single fresh ingredient (with the exception of onion and garlic). The picture above is from one of the times I made lentil curry. Saute some onion and garlic with jarred curry paste, chuck in some dried lentils, add in cans of coconut milk, tomatoes and potatoes, pop in a stock cube and bam, you've got a vegetarian meal that you can easily make from what you have on hand when you're miles away from a grocery store. This season in the Bahamas, I stocked up on canned meat (chicken and ham) for the first time. While we had relied on shelf-stable sausages before, we had never really cooked with canned meat before. It actually worked out better than I thought it would. I brought Walmart's Great Value canned chicken, cans of chicken salad (add curry powder, dried onion and dried garlic and you've got a delicious topping for crackers) and a couple of Dak Premium canned hams. I used the chicken in soups and stir fry dishes and didn't notice a real difference from fresh. I used the ham in bean soup, as well as pan fried some for breakfast. The ham was really salty, so it probably worked better in soup (skip adding any salt that the recipe calls for) and not so well on it's own. The other thing I experimented with this season was dehydrated veggies from Harmony House. I got a sampler pack from them, along with two larger jars of bell peppers and onions. I loved the bell peppers and chucked them in everything (pasta sauce, soups, curries etc.). I'd definitely buy them again. I used the onions a few times when I ran out of fresh. They worked well too. My favorite from the sampler pack was the broccoli (good in stir fry dishes). I'll probably by a larger packet of that for next season. See that picture above? That's our grill. See what it's dangling over? That's water. 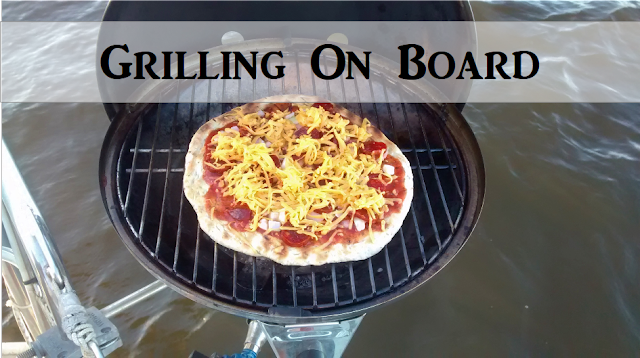 Grilling is a heart-stopping operation on our boat. Will a power boater speed through the anchorage, creating a huge wake and causing your hamburgers to slide off of the grill into the water? Will the chef drop the pizza when he's flipping the crust over and end up feeding the fish instead of the crew? Surprisingly, everything that we've cooked on the grill has ended up on our plates and in our bellies. I attribute that to Scott's superior grilling skills and ability to balance on a boat. Scott does all of the grilling on board. I think we all know that if I was in charge, then we'd lose a lot of food overboard. We grill the usual suspects - hamburgers, brats, chicken - as well as things like pizza, twice-baked potatoes (or in this case, twice-grilled potatoes) and pita bread. Grilled pizza is one of our favorite things to eat on board, but it does require a bit of preparation (making the dough and sauce from scratch and getting the toppings ready) and then you have to work like clockwork while you're grilling the pizza so that it all gets done in time without burning (grill one side, flip, add sauce, cheese and toppings and grill some more). Scott and I played a game recently where we listed our top ten favorite foods. You can probably guess what was at the top of my list - yep, that's right chocolate chip cookies. I made them a few times on board, except they weren't so much cookies as bars. One of the issues with marine ovens is that they don't heat evenly, making baking challenging. I've done all of the things people recommend - baking stone on the bottom of the oven, rotating the cookie sheet and lighting candles at Cookie Monster's shrine, but it never works. So I just plop the dough in two small pyrex dishes and make monster bars. Then, in a surprisingly display of self-control, I put the rest of the dough in the fridge for the next day. In addition to baking sweet treats like sour cream coffee cake, apple cake and baked oatmeal, I also made a lot of bread. Seriously, a lot of bread. You can buy freshly baked bread in the Bahamas and it's delicious (coconut French toast, anyone?) but at $4-5 a loaf, it adds up. Plus, we're often anchored in places far, far away from any stores. So, if you want bread on board, you have to make it yourself. Or you could go on one of those low-carb diets and not have bread. Yeah, not gonna happen on Tickety Boo. One of my go-to books for bread recipes is The Boat Galley cookbook. Not only does it have great recipes (onion bead, yum! ), but it also has helpful tips for folks new to making bread on boats and in general. My mom taught me how to make bread when I was young. It's always something I've enjoyed, but I never do a lot of unless we're out cruising. Who doesn't love snacks? Snacks make people happy. I think if they served more snacks at the United Nations, we might actually have a chance at world peace. It's hard to find diplomatic solutions that make everyone happy when stomachs are grumbling. Sure, we got around the lack of sugary treats due to my baking efforts, but eventually the pretzels and crackers we brought with us ran out. Those were dark days. Fortunately, we discovered these things called Stax. They're like Pringles, except they come in a plastic can which is totally wasteful. But they're coated with awesome sodium flavor particles (yum!) and they're relatively cheap at Maxwell's grocery store in Marsh Harbour (yay!). The only problem with Stax is that the lid on the can doesn't work. Seriously, you eat a few chips and put the lid back on the can in order to save the rest for the following day and then the lid pops off of the can all by itself flying into mid-air allowing the sodium flavor particles to waft about making any self-control you might have had disappear and forcing you to finish off the rest of the chips. Stupid lid. They really need to look into that design flaw. The cracker shortage was pretty traumatic too. What were we supposed to eat our government cheese with? We lived without crackers for quite a while and then managed to find some Jacob's cream crackers at the grocery stores in George Town and at Rock Sound. Order was restored in our universe. Crackers and cheese, together again. Those of you who follow our cost of cruising posts, where we document every penny we spend and what we spend it on, will know that one of the ways that we try to keep costs down is by minimizing how often we eat out. We actually find that what we make ourselves is almost as good as what we can get in a restaurant. That's not always the case, but there have been a number of times where we've said, "Hey, we could have made this ourselves for half the price and it would have been as good." Of course, the downside is having to do your own dishes. So, given our cheap and cheerful approach to eating out, how many times do you think we ate out while we were in the Bahamas? While you're thinking about that, here are some fascinating and not-so-fascinating tidbits related to food. Once you've read these, scroll down to find out the answer. The answer is three. Did you guess right? The first time was at the coolest laundromat ever - Miss Ida's in Black Point. She serves snack type food in the shop next to the laundromat which you can eat out on the verandah overlooking the anchorage while the wash cycle is in progress. The first time we were there, I had a chicken pattie (kind of like a curry pastie), Scott had conch fritters and we both had a can of soda pop. We liked it so much that we went back the next day for more of the same. Total cost for both visits - $13.50. I expect for some of you, snack food at a laundromat wouldn't qualify as eating out. But, that took care of our lunch both days, so it totally counts in my book. Plus, it was a definite cultural experience hanging out with the locals and learning from Miss Ida how she makes her patties. And as a bonus, we had clean clothes along with our full bellies. The other time we ate out was at a church fair in Rock Sound. We split a chicken dinner, Scott had some conch fritters and we each had a can of soda pop. Total cost - $13.00. Another great experience dining with the locals and enjoying some delicious food. Going out for drinks can be expensive in the Bahamas, so we had our sundowners on board, rather than go out. 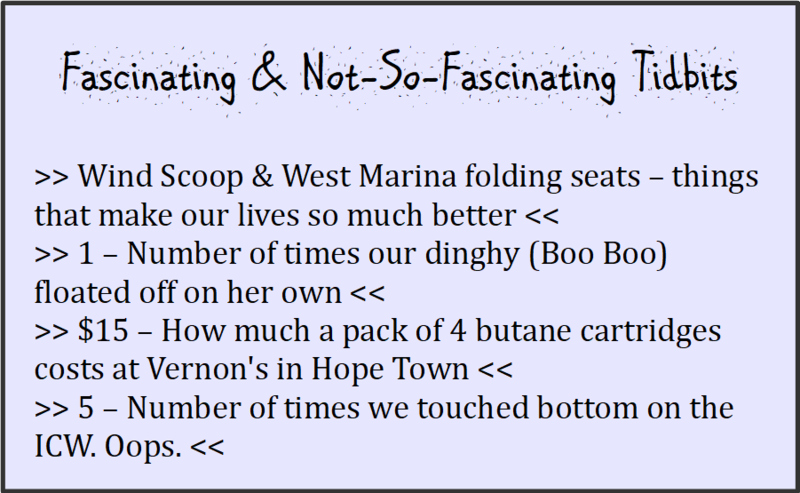 We did make a couple of exceptions when we were buddy boating with our pals in the Abacos having a beer at the Jib Room (which we think is one of the prettiest spots in Marsh Harbour) and having beers outside of the liquor store in Hope Town (they have some benches out front where you can sit and watch the world go by while you're sipping on a cold Kalik). 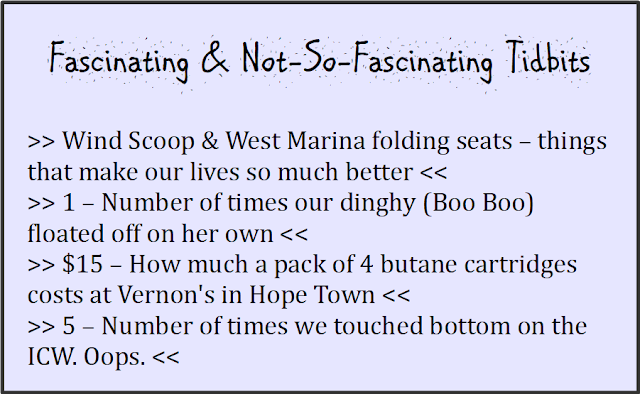 If, for some strange reason, you want to know more about what we ate in the Bahamas, check out this blog post about a week eating on board Tickety Boo. If you want to know more about our time cruising in the Bahamas, you can find links to all of our blog posts here. What's your favorite meal? 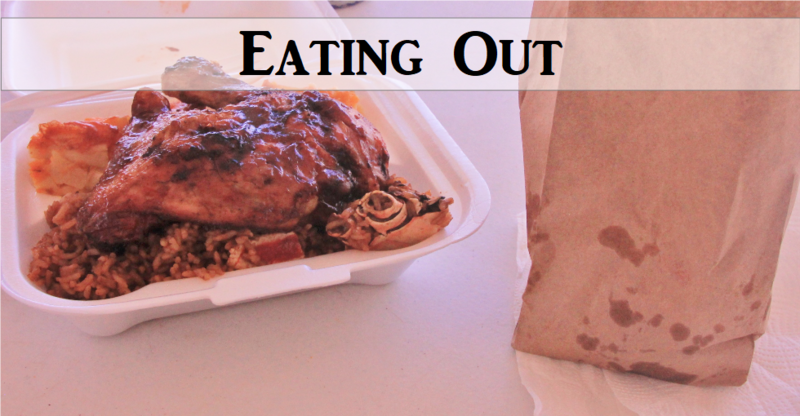 Do you prefer cooking or eating out? How often do you grill and who does the grilling in your household? I still think that's wild you can grill a pizza. Water would be a premium. I don't blame you for not wanting to waste any. Feed Scott a Reuben sandwich and then maybe he'll like sauerkraut. One time, our grill decided to disconnect itself and tried to fly into the ocean. I think Matt was making a pizza. Somehow, he lunged and caught the grill mid-air. It was very exciting and I'm not sure how he didn't get injured. I love ALL the dishware in this post. So pretty! How did he not get hurt? Scott has some war wounds from his grilling experiences. The bowl you like and the plates are from Walmart. Cheap as chips. I wish I had gotten more of the plates. The other dishware came with the boat including some nice melamine serving dishes. Why are beer and soda so expensive in the Bahamas? I'm with you on having lots and lots of coffee. I'm not sure - cost of importing it is probably the biggest factor for soda pop. Not sure why beer is so expensive as the high cost is for the local beer as well. Yeah, heating up the boat isn't great. :-( But it's kind of a necessity. I can so relate. We do it a bit different, but you fo need to plan. Eating out is very expensive. Have a fabulous Friday the 13th. Coolest thing I learned here? That bit about wrapping lemons and limes in foil. :) Thanks! We rarely go out to eat, because I'm a pretty darned good cook and it's annoying to pay more money for something in a restaurant that isn't as good as we could have at home. The exception? We love to go out for fresh raw oysters, simply because it's a pain in the patootie to shuck them. We make exceptions for certain things, like Ethiopian food. I’m so impressed with your planning and organisation. Now I wish we would have gone with a round Magna grill -- that pizza looks delicious! You can make them on the rectangular grill. Just shape the dough differently. It might even be better because you could fit two on at the same time. I love these posts. I find them fascinating. Thanks for sharing. I'd love to try a conch fritter! I haven't grilled in a couple months, but really should rectify that. Oh no, you're gonna regret leaving your grill behind :-) Grilled pizza is great! So the limes in foil trick (brilliant, thank you!) - where do you store them? Net in the cabin? In the bilge? In a locker? We just store them in a basket in the v-berth.